The lithium iron phosphate (LiFePO4) battery, also called LFP battery is a type of rechargeable battery, specifically a lithium-ion battery, which uses LiFePO4 as a cathode material. LFP batteries have somewhat lower energy density than the more common LiCoO2 design found in consumer electronics. However, it offer longer lifetimes, better power density and are safer. The major applications of LFP are transportation and backup power supply. For many years now, lithium batteries have been a trusted power source in various industries. LFP batteries are used in applications such as smartphones, watches, computers and tablets. Lithium is used in lightweight marine batteries, solar batteries and electric car batteries. Chinese electric vehicle OEMs have adopted lithium iron phosphate as power batteries of cathode materials. Additionally, China's support for new energy vehicles has promoted the rapid increase of the country's demand for lithium iron phosphate. In contrast, cathode materials for power batteries in the US, Japan, and South Korea are dominated by ternary material and lithium manganate. This report identifies the global Lithium Iron Phosphate (LFP) Batteries market size in for the year 2014-2016, and forecast of the same for year 2021. 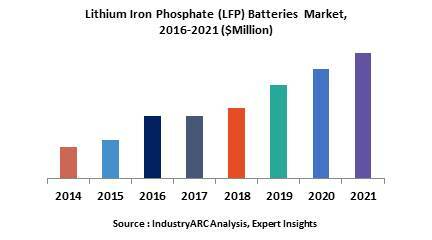 It also highlights the potential growth opportunities in the coming years, while also reviewing the market drivers, restraints, growth indicators, challenges, market dynamics, competitive landscape, and other key aspects with respect to global Lithium Iron Phosphate (LFP) Batteries market. Geographically, China is a key market for Lithium Iron Phosphate (LFP) Batteries. Asia-Pacific is estimated to witness the highest growth during the forecast period and is estimated to hold the highest share in Lithium Iron Phosphate (LFP) Batteries market. 8.6. Tianjin STL Energy Technology Co., Ltd.
8.7. Guanghan Mufu Lithium Power Materials Co., Ltd.
8.8. Pulead Technology Industry Co., Ltd.